Turn your Apple iPhone, iPod Touch, iPad as Wireless Mouse or Keyboard and control Mac or PC from anywhere from the room. Yes it is possible with the new iOS app Remote Mouse. The app works fine on all iOS devices and needs WiFi and 3G connection to connect with your Computer. 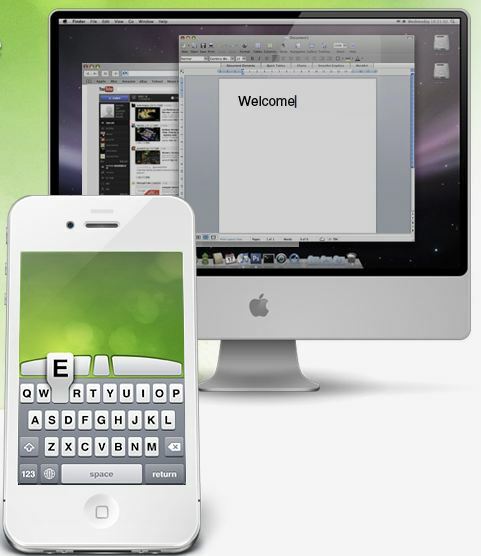 After that you can enjoy all features of wireless mouse and keyboard on your iOS device. The app is Compatible with Windows 7, XP, Vista, Mac OSX Lion/Snow leopard/Leopard. It allows you take full control of your Computer easily from your iPhone, iPod Touch, iPad tablet. Main mouse functionalities featured, including click, double-click, right-click, scroll and drag and keyboard works like a charm. 1. First make sure that your iOS device is connected with wifi and 3G connection, also the computer and device need to be using WiFi on the same network or same router. After that yoiu are ready to install the app on your iOS device and on your PC and MAC. 2. Now Go back to your iPhone, iPod Touch, iPad to install the app, download the iOS app from the iTunes store and install it on your derive to get started. 3. Now come to your Windows PC or Mac and install the desktop app from the Remotemouse website. And run the app on the desktop to get started. (Download links are available on the end of the post). 4. Make sure the Firewall of your computer didn’t block the app to run on your PC. 5. Time to run the app on your iPhone, iPod Touch, iPad, Hit the auto connect option from the first screen or do it manually by entering the computer’s IP address. 6. That’s it now you are ready to use you device as a Wireless keyboard and mouse. Tapping on your device screen is equal to clicking the left mouse button; tapping on the screen with two fingers is equal to clicking the right mouse button; sliding two fingers on the screen is equal to sliding the mouse wheel. There are some more features on the app like extended keyboard and function keys, but you can enjoy these feature after buying the paid version of the app. The price of the paid version iPhone and iPod touch is $1.99 and for iPad $2.99.